There is an engrained belief that a cellar should be dark. While this belief is not exactly on the wrong side, the arguments about the relationship between light and wine have been contradictory throughout time. Some say it is the heat generated from light sources that harms wine, while others claim the light itself is detrimental to the chemistry of wine. These issues must have been known for a long time because traditional wine cellars are almost always dark and most wine bottles are made of colored glass. People discovered the advantages of darkness by trial and error in the old days. Today, we know for a fact that light is detrimental to wine; it generates heat, which disturbs the temperature stability inside the cellar, while directly affecting the chemical reactions during the maturing of wine when it’s in the bottle because light is a source of ultraviolet and infrared waves. The first precaution to take, these days, is to not let your wine remain in complete darkness. Darkness is unpleasant, even unsafe. We can now measure, calculate, and filter these effects using technology and create a controlled―as well as pleasant―atmosphere inside the cellar. The amount of ultraviolet and infrared waves of light depends on the type of light source. While sunlight emits the highest amount of these harmful waves, fluorescent and incandescent light sources follow closely. LEDs, on the other hand, emit negligible amounts of ultraviolet and infrared waves. LEDs also create considerably less heat compared to incandescent lights and, of course, sunlight. A LED lighting system is energy efficient and has a life expectancy of up to 100,000 hours. So, when it comes to choosing the right type of lighting in your cellar, LEDs are now accepted to have the upper hand. Once lighting is introduced inside the cellar, there is so much you can do with it. You must be careful about the amount of light in the cellar because of both technical reasons listed above. You must also take into account any aesthetic concerns. A cellar as a place connotes coziness through dimness. Lighting has a strong impact on the mood in the cellar, therefore, illumination in the cellar space should be carefully regulated. The exact location of the light sources and the amount of light each one creates become the subject of a study, which we call the lighting design. While we want the general lux level in the cellar to remain low, we want wine labels to be readable. Wine enthusiasts most certainly make the effort to read the information provided on the bottles. 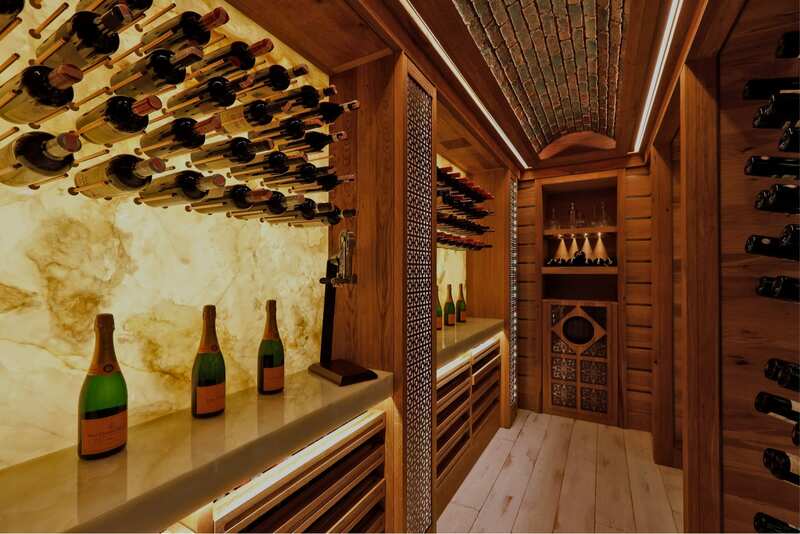 There are several ways to create a diversified and elegant lighting scheme in your cellar. Create little niches where light is recessed but more intense. Concentrate light on certain rows of bottles while placing (vintage) sconces that contribute to the general cellar feel atmosphere. Build dimmable (colored) light coves that highlight the ceiling details. When the lighting is perfect, all other design elements and decorations are enriched, improving the overall ambience.